Provincial Grand Lodge met at the regular meeting of Reserve Forces Lodge of Northumbria to invest WBro Alasdair Watson TD as our newest Assistant Provincial Grand Master. The Provincial Grand Master, RW Bro Ian Craigs, presided over the meeting with his new team of Provincial Officers who were occupying their respective offices for the first time since they were appointed at the Annual General Meeting in November (they all did a fantastic job and if they were nervous it certainly didn’t show). WBro Alasdair was escorted into the Lodge by an honour guard of brethren whom had each played a significant role in his Masonic journey. WBro George Wady had the honour of carrying the chain of office as the Cusion Bearer accompanied by Worshipful Brothers Euan Duff, David Southern, Nigel Clothier and John Harvey. 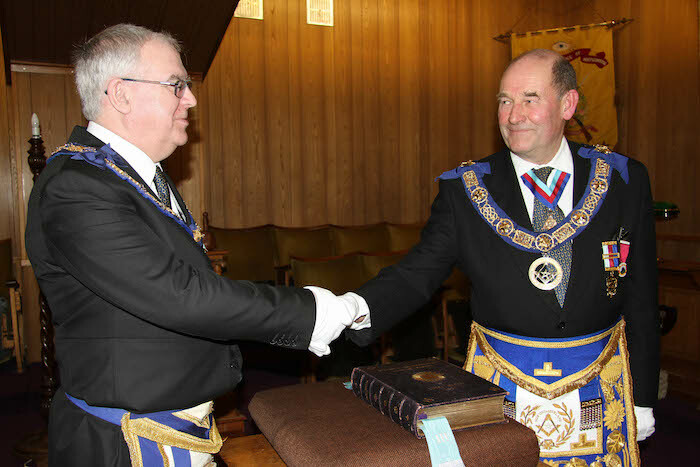 After solemn prayer, Alasdair took the oath of office and the Provincial Grand Master invested him with his chain of office. The festive board afterwards was a wonderful occasion with music selected by WBro Alasdair to reflect his service in the Military and a four course banquet followed by (lots of) port. In replying to the toast given by WBro David Southern, Alasdair commented on how much he was looking forward to carrying out his new role and thanked the members of Reserve Forces Lodge for their support over the years which had made his appointment as Assistant Provincial Grand Master possible. The occasion of WBro Alasdair’s investiture as Assistant Provincial Grand Master was a wonderful Masonic celebration enjoyed by over 70 brethren in attendance. In his remarks at the festive board our Provincial Grand Master congratulated Alastair and wished him every success in his new role comments supported by all Northumberland Freemasons.